Did you notice when change became the constant, and continuity became irregular and intermittent. I noticed it last spring when everything began to get harder. All the things that I’ve been doing for almost a decade and a half all of a sudden became much more difficult. It was an immediate experience of a kind of change that told me we aren’t going back to the good old days. I had entered my own Transition Point. If change is constant, then we need to rethink how we understand our experience of it. If your work becomes harder, your performance begins to drop or your business declines over night, then you understand that you are at a transition point. When we encounter these moments of change, we need to look at how we can make decisive changes to become different. This means that we stop doing certain things, and start doing new ones. Knowing what to do is the challenge we all face in dealing with change. 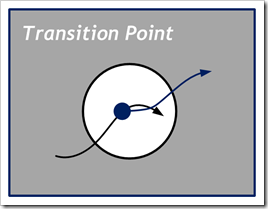 These transition points are markers, sign posts, signaling to us the need to change. They should lead us to a begin a developmental process that carries us through to our next stage of achievement. 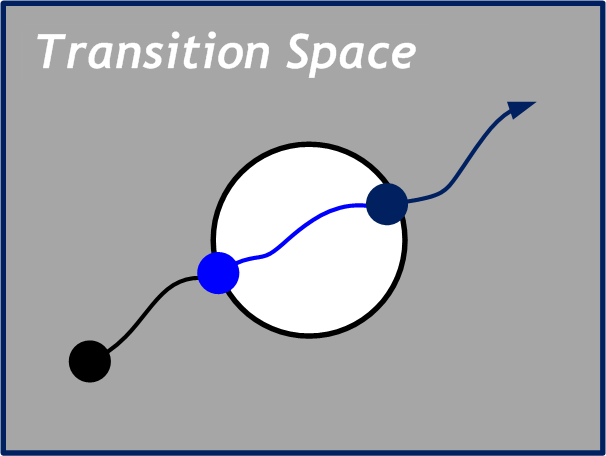 The space between these transitions points is where leaders need to give their attention. 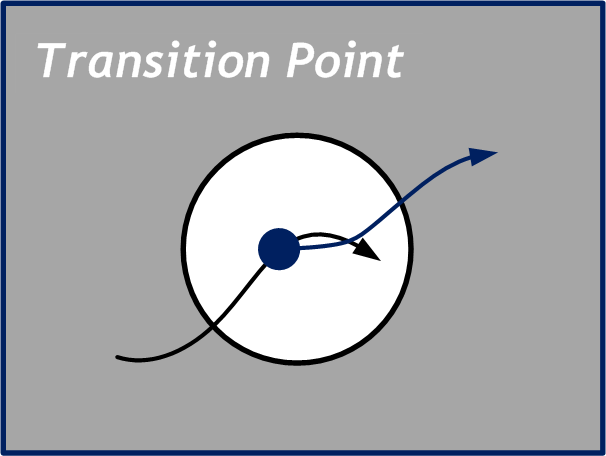 Spend just a moment recognizing that you are at a point of transition, and move on. Do this because we don’t live in the transition point, but in the space between them. 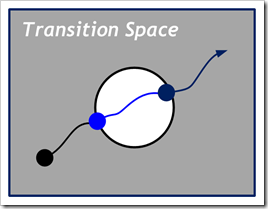 The great challenge facing leaders in the future is managing these transitions spaces. They are so challenging because they are not defined by the standards of the past. When I began my planning work with clients in the mid-1990s, we’d look three to five years out. Now, we focus on specific changes and how to implement the plan in as short a period of time as possible. It is now time to stop talking about change, which is a perception of disruption in an environment of continuity, and talk about managing the transition from one stage to the next. It is important to know where you are right now, to know what your transition point means, but your energies are going to be focused on managing the space between these points. When we read about adaptive leadership (See Heifetz, Grashow and Linsky’s The Practice of Adaptive Leadership), we are looking at a different way to manage the processes and products of our organizations. To adapt is to recognize where you are and to make the necessary changes to take advantage of the situation as it exists. This is how we make a transition from one point to the next. It is in the transition that we discover a new kind of continuity. If change is now a constant, then where do we find continuity that makes a difference? First, our perception of the context of business must change. We need to understand that change is not some occasional interruption, but the way things are. It happens in short, micro-moments, and long-term periods of growth and decline. Hidden opportunities are embedded in changes that provide organizations a way to progress forward. Being able to see these opportunities requires us to be able to see change as a constant presence. Second, our perception of relationships within organizational structures must change. The legacy structures of the past are poorly equipped to absorb the level of change demanded of us today. As a result, a greater dependency is placed on our ability to work collaboratively with people. Third, our perception of the importance of the personal character of leaders must change. Character is not just how one manages interpersonal relationships. It is also how one handles the demands of change. Clear sightedness, resilience, determination, humility and trustworthiness are keys to being a credible leader. These are not academic skills learned in school. This is the maturity learned from mentors and purposeful training. Fourth, our perception of the importance of values must change. In an environment of constant change, an organization’s mission can change. Its vision for impact and achievement can change. Its organizational structure can change. But what should not change are the values that guide the decisions and actions that are the path through the transition space that is present everyday. The role of values guides how relationships function and become the source of unity and a common commitment to the company’s future. Lastly, our perception of change must change to see it as a continuous process of transition through time. When we adopt this understanding, the disruptiveness of change fades, and we can more easily see the opportunities embedded in constantly changing circumstances. The more I’ve adopted this approach to my work, the more I see how many things that I’ve done over the years remain with me as I begin new things. Continuity is a perception that gives us a greater sense of strength and confidence for managing the demands of our life and work together. Change, as result, becomes less a threat, and more a dynamic space for creativity and innovation that leads to new achievements in the future. Tagged with change, character, constant, continuous, disruptive, leadership, perceptions, process, relationships, space, transition, values.